23-year old Eric Muhayumukiza (SF-95) had an amazing evening in the last round for IPRC-South and receives a Interperformances Player of the Week award for round 11. He had a double-double of 27 points and 13 rebounds, while his team outclassed, the league's bottom-ranked team UR (#9, 0-10) with 54-point margin 110-56. 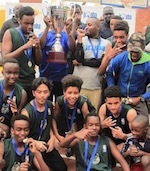 IPRC-South is placed at 4th position in Rwandan league. IPRC-South is a typical solid league team placed somewhere in the middle or a little bit lower in the standings. They need more victories to improve their 5-5 record. In the team's last game Muhayumukiza had a remarkable 80.0% from 2-point range. He turned to be IPRC-South's top player in his first season with the team. Muhayumukiza has impressive league stats. He is in league's top in points (9th best: 15.9ppg), rebounds (2nd best: 11.1rpg) and averages solid 1.1bpg and 60.4% FGP. Second best performed player last round was Olivier Shyaka (197-SF-95) of top-ranked REG. He is former international in his first season at REG. In the last game Shyaka recorded impressive double-double of 23 points and 14 rebounds. Of course he led REG to another comfortable win 100-81 over the lower-ranked UGB (#7, 3-8) being unquestionably team leader. Of course REG still keep the league's top spot. His team belongs to top of the standings with 10-1 record and is considered one of the main candidates for the league title. Shyaka is a newcomer at REG and quickly became one of team's most reliable players. Third place about best performers goes to guard Jacques Boissy (SG) of UGB (#7). Boissy got into 30-points club by scoring 32 points in the last round. He went also for four assists. Despite Boissy's great performance UGB lost 81-100 to the higher-ranked REG (#1, 10-1). But his team cannot count on just a single shooter as he also needs help of the other teammates. UGB can only dream about fighting for top spots in the league. They have rather bad season and 3-8 record places them close to the bottom of the standings. Too bad for Boissy he does not play for a better team. But maybe if he did, his season stats would not be that high. Boissy has a very solid season. 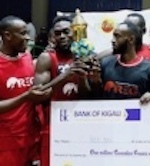 In 4 games in Rwanda he scored 22.5ppg.